On a brisk, sunny day in mid-October, I drove through the affluent suburbs of Craig, Colorado, to a cottage-style house, where I’d been invited to breakfast. Josh Flaharty, a dark-haired 29-year-old with a thick goatee, tattooed arms and a slight potbelly, answered the door and welcomed me inside. Flaharty, whom I’d met the night before, had been out of prison two months and was staying here, at his parents’ house, while he got back on his feet. He led me through the warmly lit home, down a narrow hallway, past woodcarvings of grizzly bears and into the kitchen, where he was making French toast and listening to rap music on a large PC tablet. We spoke briefly about his parents, who were at work, and about his former business building car stereos, which he called Audio Pollution. Before long, though, we were talking about his drug habit and his days as a dealer. Percocet was the easiest drug to find back then, he told me, and selling pills was less risky than heroin. He’d had plenty of practice breaking down opiate painkillers. Josh Flaharty uses a syringe to inject Adderall, for which he has a prescription. While the medication comes in pills, “slamming” it produces a more immediate effect. I first traveled to Craig in March 2016, drawn by reports of the opioid crisis unfolding there. 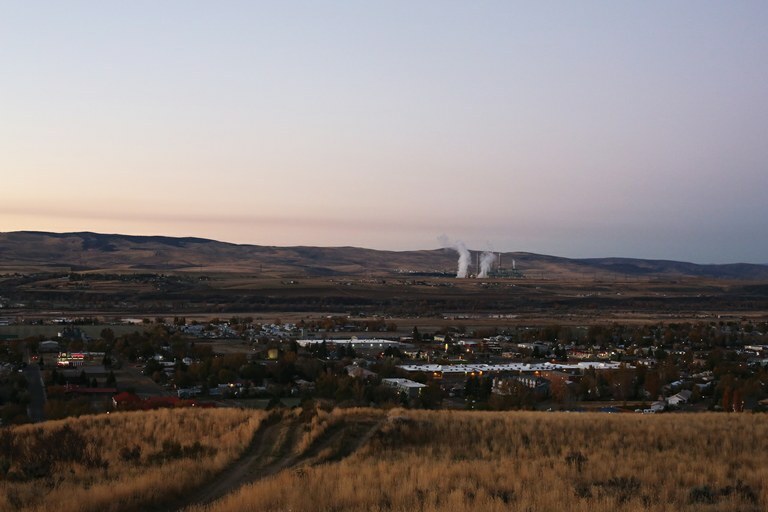 Craig is a conservative community of about 9,000 people, a rundown extractive town past its peak. Along the main drag are two pizza restaurants, a feed store, a barbershop and a liquor store. Shuttered storefronts offer glimpses of yesteryear. Craig exists in an economic purgatory, unable to grow, unable to adapt to new economic realities. Like other coal towns, Craig has seen a sharp downturn in its mining-based economy. Federal regulations and the low cost of natural gas have combined to create the worst economic climate for coal in decades. Craig’s mining wages declined 24 percent between 2010 and 2014, according to a 2015 analysis by Headwaters Economics. Real estate values dropped 8 percent in the same period, as 1,000 residents left Moffat County. Craig’s mines are facing a slumping coal market, new and expensive pollution rules, and federal plans to preserve habitat for the dwindling sage grouse. “If you were to draw a bull’s-eye in the West where everything is converging, it is Moffat County,” County Commissioner Chuck Grobe told the Denver Post last year. For all its misfortunes, Craig remains a place where kids play in the streets, teenagers flirt at the town park, and older folks brag about the 2 percent sales-tax rate, among the lowest in the nation. Many of the people I met there during weeks of reporting over the past year were proud, steadfast, determined to look past the town’s frayed edges and into its future. But first they had to confront the local addiction crisis. The problem lurked out of view for years, but now it was in the open, metastasizing, threatening to overwhelm doctors, teachers and police. Since 2014, Moffat County’s law enforcement has documented nearly 230 incidents where narcotics were confiscated. In 2016, they arrested 96 people, three times as many as in 2010, according to the Colorado Division of Criminal Justice. Yet even as the prevalence of opiates and heroin rises, the area’s modest law enforcement is plagued with declining budgets. 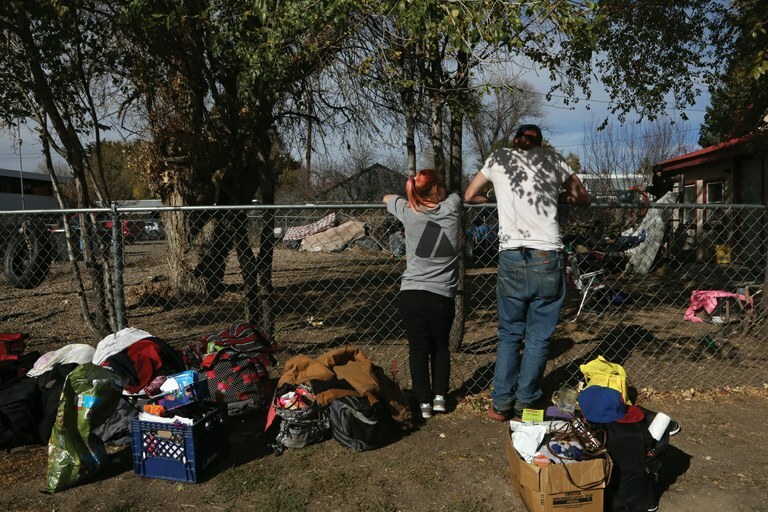 Addiction has swept through the town’s population of 20-somethings — and their parents. At one pizza place, a waitress told me about friends who had come and gone, addicted to prescription painkillers, uppers, downers and street drugs. Other waitresses and bus boys helped me fill my notebook with the names of local addicts, as well as stories of the drama, bad luck and rumors that buzzed around their lives. Residents, police and other addicts described the realities of the epidemic in painful detail. Most everyone agreed it all started in 2006, when a private pain clinic, High Country Medical, opened downtown. 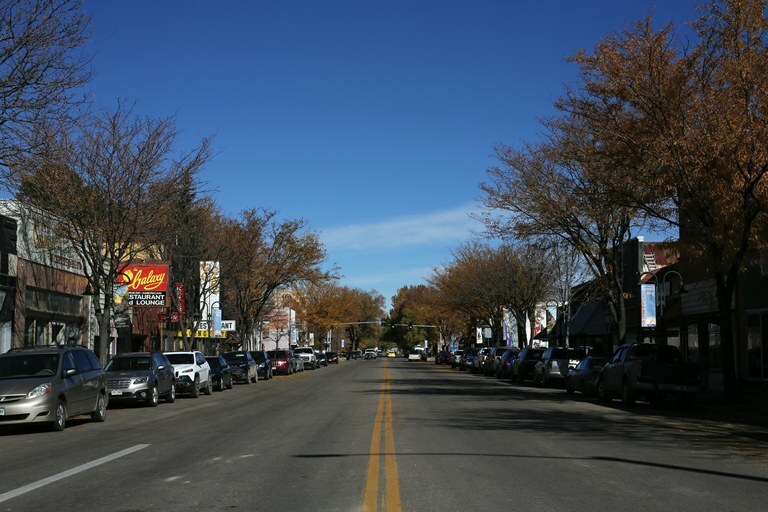 Yampa Avenue in downtown Craig, where many businesses closed after a downturn in its coal-mining economy, and where Dr. Joel Miller opened his pain clinic in 2006. 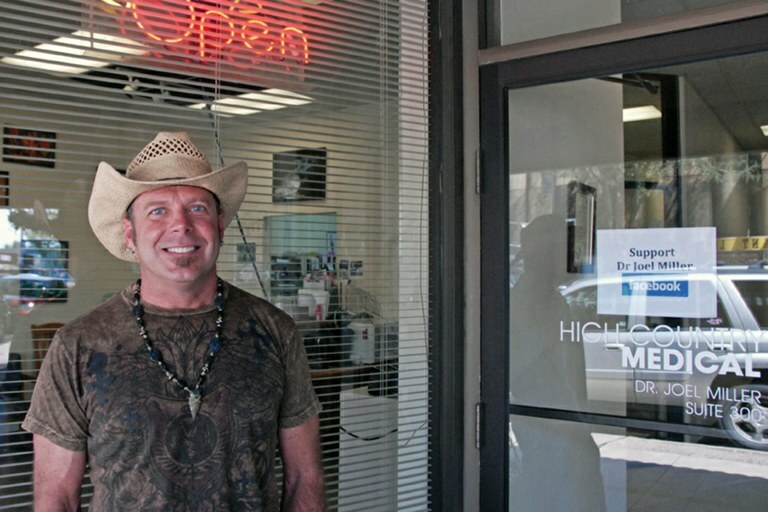 Joel Miller outside the High Country Medical clinic he operated in Craig between 2006 and 2012. Miller kept operating the clinic even after the Colorado Board of Medical Examiners suspended his medical license. The shift created a new market for brand-name pain pills, and several pharmaceutical companies, including Purdue Pharma, Insys Therapeutics and Endo Pharmaceuticals, developed new medications. Opiates provided the most effective pain relief. So spread the use of MS Contin, OxyContin, liquid morphine, Vicodin — even a medicated lollipop laced with fentanyl, a manufactured opiate painkiller 80 times more potent than morphine. Initially, these new painkillers were marketed as alternatives to addictive opiates. In fact, they created their own addictions. In 2006, executives of Purdue Pharma, the manufacturer of OxyContin, pleaded guilty to criminal charges for “misbranding and misleading the public” about the drug’s risk of addiction and potential for abuse. In its OxyContin settlement, Purdue Pharma paid $634.5 million in fines to the Justice Department and to resolve civil lawsuits brought against them by patients who became addicted after being prescribed the substance. Yet between 1995 and 2001, Purdue Pharma made $2.8 billion in revenue from OxyContin, and the year after its settlement, made more than $1 billion. By then, numerous OxyContin copycats and generics had entered the market, and the fervor for prescriptions was outpacing society’s understanding of addiction or the best treatment for long-term pain. 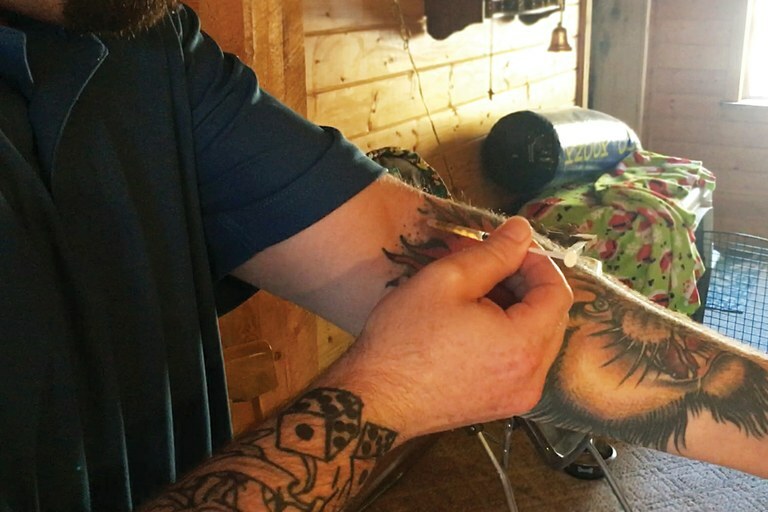 In the West, opiate addiction spread quietly, especially in rural areas, where the social stigma prevents communities from resourcing detox facilities, needle exchanges and other programs for addicts. In 1999, approximately 4,000 people died nationwide from opioid pain relievers. In those early days, northern New Mexico towns like Española had the highest death rates from prescription painkillers and heroin, but soon many counties across the West would catch up. In Colorado, in 1999, only 1 percent of treatment admissions in rehabilitation programs were for prescription opioids, according to the Substance Abuse and Mental Health Services Administration (SAMHSA). According to the CDC, in 2006 nearly 14,000 people nationwide died from overdoses on opioid pain relievers. By 2009, four out of 10 Colorado adults admitted to misusing prescription painkillers, according to a survey by the Colorado Consortium for Prescription Drug Abuse Prevention, which was founded a year earlier to address the epidemic. In 2012, U.S. physicians dispensed 259 million prescriptions for opioid painkillers, enough to give a bottle of the pills to every adult in the country. By 2015, 20 percent of patients in drug treatment were there for opioid addiction, the highest rate of any substance, according to the most recent survey, published in 2016 by SAMHSA and the National Institute on Drug Abuse. Craig and its residents were caught as unaware as any town in the country. In 2006, when Miller was establishing his clinic, Josh Flaharty was a high school junior in the nearby town of Oak Creek, 30 minutes from Craig. By 17, he’d shuffled through other high schools. He and his family moved to Craig, and he wrestled with “behavior issues.” He was shy, had few friends, and struggled with attention-deficit disorder and depression. Things got better after graduation, especially when Flaharty adopted a brindled boxer named Mr. Bubbles. His luck didn’t hold, however. One day, Flaharty took Mr. Bubbles to a junkyard in Oak Creek. As Josh rummaged around for stereo parts to rebuild a set of speakers, Mr. Bubbles slipped away and onto the property of a rancher, who shot and killed the dog. That experience proved deeply traumatic to Flaharty, who was soon after diagnosed with bipolar disorder, schizophrenia, depression and post-traumatic stress disorder. In 2010, he underwent a spinal fusion surgery to fix two slipped discs in his back, and was prescribed an opiate painkiller. The Moffat County Sheriff’s Office shares a single-level tan-brick building with the Craig Police Department and Colorado State Patrol. On a clear, frigid night in March, I arrived at the office to meet with Sgt. Courtland Folks. Folks is 45 and stoic, the head of the county’s K-9 unit, whose drug-sniffing dogs are used to combat the spreading drug epidemic. Like Flaharty, he came to Craig as a pre-teen and struggled in high school, eventually getting involved with “the wrong crowd,” he told me in his office, where a large bong, confiscated, sat atop a filing cabinet. He experimented with drugs as a teenager in Craig, joined the Army after high school, and returned home in 1994. “In the military, the drug scene doesn’t quit,” he said. “So that continued. And then I came back and drove a truck. Obviously, there’s drugs everywhere when you’re running the interstate. Those first-hand experiences were my life on the other side of the badge, so to speak.” In 2000, he joined the sheriff’s office, and by 2004 was head of the K-9 unit. During many of those calls, officers found medical bottles with Joel Miller’s name on them. Miller told me his practice filled up with patients in its first year. By its one-year anniversary, High Country Medical was seeing 25 to 30 people on a typical day, in a county of about 13,000. In 2010, Colorado implemented a new prescription pill-monitoring program, which created a statewide shared database for doctors, pharmacists and other health care providers to track patients’ medication use, in real-time. A young, ambitious investigator on Moffat County’s special crime force, Ryan Hess, began looking into reports from community tipsters about High Country Medical. “There were several doctors, practitioners and pharmacists in the area that had, throughout a period of, I’d say, about two or three months, came up to me and spoke to me about Miller’s practices,” Hess told me. A City Market pharmacist, a nurse practitioner and an emergency room doctor all reported that Miller’s patients were being over-prescribed medication to the point of abuse and addiction. Over the year, Hess, analyzed patterns and interviewed dozens of witnesses, including Miller’s patients. He suspected Miller’s practices were enabling some of his patients to distribute painkillers to drug users in the community, and began building a case. Hess started referring to High Country Medical as a “pill mill … totally out of control.” He reached out to the federal Drug Enforcement Agency and the Colorado attorney general’s office for help with his investigation. On a late summer evening in August 2010, police responded to a report of a fatality in a mixed industrial-residential neighborhood in Craig. At a small white home, officers Travis Young and Josh Martinez found a group of distraught teenagers, who pointed them to one of the bedrooms. There, on the floor, they found the body of Shelly Volkmar, 44, in shorts and a tank top, lying on her back. Her hands were folded together, as if in prayer, and there were remnants of dried white foam around her mouth. As they searched the stuffy room, amid food wrappers and tissues, they found pain pills stashed under the bed and, on a small table, an open packet for a fentanyl patch, the likely cause of the overdose. The patch had been prescribed by Miller. Steam rises from the Craig Station, a coal-fired power plant that sits above the northwest Colorado town of Craig. On a crisp Monday morning in April 2012, Moffat County officers, an officer from the Colorado attorney general’s office and three DEA agents entered the back door of High Country Medical, search warrant in hand. They found Miller’s office torn apart, moving boxes and patient files scattered throughout. Miller and his staff, perhaps tipped off, had tried moving out of the office space and into an office across the hall. Undeterred, the team quietly entered that office’s back door and approached the front counter, where they found Miller talking on his cellphone. The doctor made eye contact with John Gjellum, a special agent with the DEA, but stayed on his phone for around half a minute. By then, Hess, the attorney general’s office and the DEA had been investigating Miller for nearly two years, and there was a strange moment of calm as Gjellum waited for the suspect to get off the phone. Then Gjellum served his warrant. Investigators found a refrigerator in the break room full of hard liquor, and they seized loose prescription drugs, including fentanyl patches, the strongest prescription narcotic available. No one was arrested, but Hess had Miller’s patient records and began putting together a grand jury indictment for Miller’s prescription practices. Just 10 days after the raid, a 53-year-old former coal miner named Philip Bachle overdosed on a combination of hydrocodone, an opioid pain medication, and diazepam, a sedative that treats anxiety, both prescribed by Miller. The miner was found alone in his apartment several days after his death. He had no children and no family. There wasn’t even an obituary in the Craig Daily Press, the town’s only newspaper. On Aug. 26, 2013, police arrested Miller and charged him with health care fraud, unlawfully distributing controlled substances and dispensing substances resulting in death. On Nov. 9, 2015, Miller was found guilty of seven counts of unlawfully distributing controlled substances and for providing false information to the DEA and state medical board. (He was, however, cleared of the charges related to the deaths of Volkmar and Bachle.) He was ultimately sentenced to five years in prison. Given the nearly two years he has already served, he could be out as soon as December 2017. In fact, it was many of Miller’s patients who became collateral damage. Some of the worst damage may yet be to come. In late 2010, as he filled a prescription, Flaharty complained to the pharmacist that he thought he was supposed to get more pills than he’d received. The pharmacist, who logged the incident in the Prescription Drug Monitoring Program, flagged him. His doctor, based in Steamboat Springs, was alerted and dropped him as a patient. Flaharty had other doctors and a counselor, and therefore a steady supply of Adderall, which he says allayed the worst of his opioid withdrawal. He began abusing that, too, taking more than 60 milligrams a day. As his tolerance built, he started breaking it down and shooting it up. When that didn’t feel like enough, and often it didn’t, he would smoke meth. And because he was already using his medications intravenously, it wasn’t long before he was shooting up meth, too. For years, Flaharty got by on meth and medication. He became the go-to guy for many meth users in Craig, and while he could get most of his supplies locally, sometimes he would go down to Denver to re-up. On one of those trips, in 2014, he was offered heroin for the first time. He smoked it. “I honestly don’t remember a lot about that, but I thought it was good enough to bring it back,” Flaharty said. He wasn’t the only one who started selling heroin in Craig; according to local law enforcement, other dealers were bringing it in from Wyoming, Denver and Steamboat Springs. “It started to be that thing that a lot of people wanted,” Flaharty said. In 2014, Ted Cicero, the researcher at Washington University in St. Louis, joined the Center for Applied Research on Substance Use and Health Disparities at Nova Southeastern University to study a shift in the demographics of heroin users. Until then, there hadn’t been any research on heroin users today compared to 40 to 50 years ago, but researchers suspected they had changed. Cicero and his colleagues used data from an ongoing nationwide program called the Survey of Key Informants Patients (SKIP), which consists of 150 public and privately funded drug rehabilitation and treatment centers across the country. SKIP recruits its clients to participate in an anonymous survey that asks them to explain their personal patterns of abuse and addiction. In return, participants — 85 percent of patients approached completed the 2013 survey — received a $20 Wal-Mart gift card. Of more than 9,000 recovering opioid addicts that completed the survey, nearly 3,000 reported heroin as their drug of choice. Cicero focused on that subset, seeking users willing to give up their anonymity for a structured interview. Fifty-four people responded. Over a three-month period in 2013, they described their relationship to heroin and to prescription opioid compounds like fentanyl or oxycodone. Cicero identified three patterns. Some chose heroin because it was cheap and easy to find, and others because it was easy to inject. Still others used it because the high was comparable to that produced by prescription painkillers. The study also found a major shift in users. In the 1960s, 83 percent of heroin users were men in their early 20s, typically minorities living in urban areas, whose first opiate experience was with heroin. According to Cicero’s study, the vast majority of heroin users today, 75 percent, are, on average, 23 years old, both men and women, living in rural or suburban areas, who were introduced to opioids through prescription drugs. Even though whites and non-whites were equally represented in Cicero’s study, 90 percent of respondents who started using heroin over the last decade were white. “Prescription opioids are legal, are prescribed by a physician and are considered trustworthy and predictable,” Cicero told me. His study found that despite the fact that users viewed painkillers as “safer,” some prescription opioid abusers, particularly those who inject or inhale their drugs, graduate to heroin. “The pharmaceutical industry and the approach to treating pain has essentially primed the market for heroin abuse,” Cicero said. In May 2016, Purdue Pharma issued a statement defending its popular drug, OxyContin: “For more than a decade, Purdue Pharma has sought to play a constructive role in the fight against opioid abuse, including by reformulating OxyContin with abuse-deterrent properties and leading our industry in this area of innovation.” In December 2016, in a rare show of unity among a deeply divided Senate, Congress passed the 21st Century Cures Act, which provides $500 million a year to help states prevent opioid abuse and get better treatment for addicts. In 2010, states across the country began improving and implementing prescription pill-monitoring programs, which were inconsistently used by doctors and pharmacists before. The programs helped doctors see exactly what prescriptions their patients were using, when they were prescribed, when they were picked up from pharmacies and when they were refilled. They could also tell whether or not their patients were seeing more than one doctor. The information made it possible for physicians to discover whether a patient was “doctor shopping” or potentially abusing prescriptions. These regulations led to more dismissals of patients by doctors, as happened to Flaharty, and to crackdowns on “pill mills,” including High Country Medical. As a result, fewer prescriptive opioids made their way into the medicine cabinets of middle-class users. Unfortunately, many of those people had already become tolerant to high doses, and this appears to have led to increased heroin use. Of the 9,000 respondents in Cicero’s SKIP survey, 88 of the heroin users said they started in the 1960s; more than 1,600 said they took up the drug after 2000. Of those in the second group, 94 percent reported their first opioid use through prescription pills. One of Cicero’s interviewees explained the shift: “OxyContin was getting harder and harder to get and the pills you could get weren’t as easy to use in a needle. They would just ‘gel up.’ It was cheaper and easier to get heroin, which was much stronger and would get you higher than Oxycodone (a generic version of the drug).” Because opioid prescriptions and heroin are both opiate derivatives, the highs are similar. Some users reported a “cleaner” high from prescriptions, but found heroin cheaper and easier to find. In Colorado, all licensed pharmacists and prescribers are required to register a Prescription Drug Monitoring Program account and log all visits and the drugs dispensed in real time. Other states across the West began implementing their own monitoring programs, following Colorado’s lead and ensuring that the reporting tools were up-to-date. 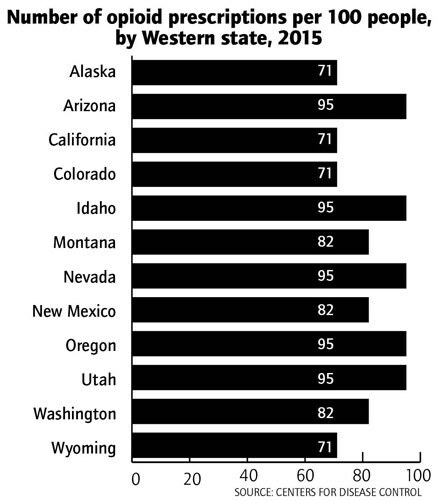 Colorado, Oregon and Washington were among the most aggressive users of monitoring programs to crack down on pill abuse. In September 2016, the U.S. Department of Health and Human Services established $11 million in grants for Colorado, among 10 other states, to expand rehabilitation services for those with opioid addiction disorders. The state has among the highest treatment rates, according to SAMHSA, and so far has received more than $51 million in federal grants to fight addiction. Yet the problem stubbornly persists. Meanwhile, Craig’s police department budget has continued to decrease, falling from $3.2 million 2013 to $2.7 million in 2015. That means Folks and the other police in Craig are facing a growing problem with diminishing resources. And the very nature of Craig, with its rural isolation, has made things even more difficult. Not only is law enforcement overwhelmed, but other services are, as well. The drug courts are crowded with cases and there are no nearby facilities where addicts can go to recover. In urban areas, addicts have access to detox facilities, methadone clinics that can help them get back to work, rehab centers and mental health services. In Craig, there are none of these. So addicts tend to stay addicts, finding short respites of sobriety in jail or through drug court. When I visited Craig in October, I went in search of the kind of help available to an addict there. A wild goose chase ensued. I called the numbers listed online for those who sought to get clean, and checked the phonebooks for local Narcotics Anonymous groups. I was met with dial tones and the screeches of out-of-service numbers. Some of the numbers connected me to former contacts now based in faraway places. None of the information I could find seemed current. I searched Facebook support groups and visited a halfway house to see if I could talk to recovering addicts, but no one would help me. I attended an Alcoholics Anonymous meeting, hoping that I might meet someone who could help me learn more about options for drug addicts. There, a friendly, tired woman told me about a weekly Narcotics Anonymous meeting at the Christian church on Ledford Street, run by a woman named Elizabeth Tucker. On a warm Thursday evening, I arrived at the church, which sits next to a Pizza Hut downtown. A few other cars idled in the parking lot with their just-out-of-view drivers waiting inside. A young man sat in his car smoking, his cigarette peeking through a slightly opened window. At last, Elizabeth Tucker arrived. She wore a white hoodie, her long black hair framing a pale face with light blue eyes. I followed her and a small group of others through the church’s back door, and, once she had turned on the lights, introduced myself. We talked as she began setting up chairs in a circle. Tucker, who is 28, was one of Miller’s patients. She’d first gone to see him for elbow pain, shortly after his practice opened. He prescribed her a high-dose hydrocodone. That worked for a while, but when the nagging pain returned, Miller upped the dose. She stayed on painkillers for more than a year. She began gaining weight, so Miller wrote a prescription for a schedule II amphetamine, meant to treat attention deficit disorders. After Miller was arrested, Tucker tried to find pills on the street, but that was getting harder. Without the pain pills, she went into withdrawal and would be debilitated for days. To counter that, she’d take amphetamines. When she ran out of those, she went looking for crystal meth, which was cheaper, longer-lasting and easy to find. She lost track of days at a time, befriended other addicts, got kicked out of one place after another. Two years of her life passed. She had three children and lost them to social services. “It’s impossible to describe the personal failure of being a mother that loses her children,” she told me. 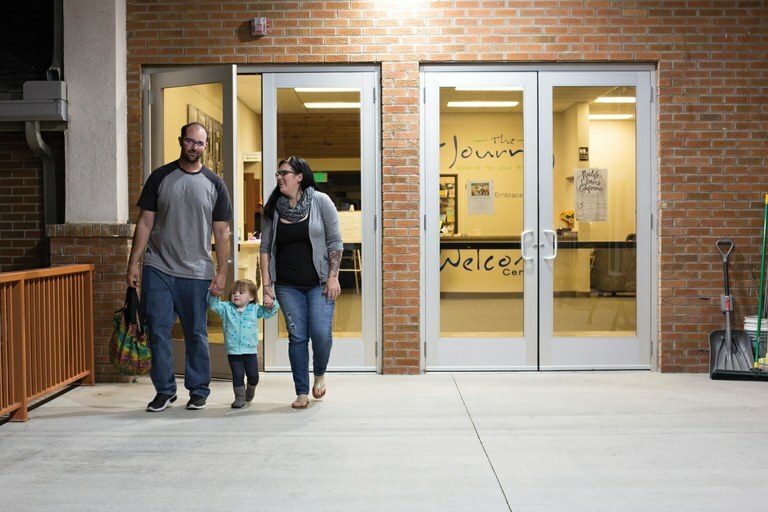 Elizabeth Tucker leaves a church-sponsored addict support group with her husband, Adam, whom she met in parole court and did meth with, and her daughter Emma. Elizabeth Tucker was one of Joel Miller’s former patients who eventually became addicted to meth. Now that she’s in recovery she organizes the local Narcotics Anonymous group, one of the few services available for recovering addicts in Craig. That experience spurred her recovery, however. There were few services, as NA and AA groups formed and dissolved, depending on the woes of the people running them. She met Adam, now her husband, and they used and struggled through their addiction together. Then she got pregnant but continued to use until a few weeks before her due date. In 2014, she had a fourth child, a baby girl named Emma, and she’s been clean ever since. “We saw a window where we could be a family. So we did,” Tucker said. In Craig, this counts as a success story. Tucker’s NA meeting is the only one for 40 miles, held once a week. Eventually, the dozen or so chairs she had set out were filled, by men and women aged mostly from mid-20s to late 50s. One man had come down from Wyoming. The meeting took about an hour, and when it broke up, I chatted with some of the participants behind the church, as they lit up cigarettes. A young man with dark hair and a goatee approached and introduced himself. His name was Josh Flaharty. “So, this is it,” Elizabeth Flaharty, Josh’s mother, said as we walked into a green and white trailer, in a mixed commercial and residential zone in downtown Craig. “If you would have come here six months ago, those windows would be broken, this step here would have been broken. It’s a lot better now.” Josh Flaharty stood nearby, quietly, letting his mother do most of the talking. From the outside, the place didn’t look so bad. Josh had parties, and sometimes people trashed the place, but he hadn’t lived here since June. It had been mostly patched up, with new siding on the outside and drywall plastered inside. But there were still dents in the door and black stains where people stubbed out cigarettes on the makeshift porch — scars that hinted at Josh’s old life here. Elizabeth pointed out a “No Trespassing” sign duct-taped to the front of the trailer. “We had to put that there, because after Josh was arrested, there were still people trying to come here and use drugs,” she said. On June 25, 2016, Josh was using drugs with his regular circle — three other local addicts, including a man who was crashing at the trailer after a days-long binge of heroin, pills and meth. Josh eventually fell asleep, he claims, then woke up with the man’s hands around his throat. Josh says he fought back, knocking over a hubcap ashtray and spilling ash and cigarette butts on the carpet, before he grabbed a wood plank and beat the man unconscious. A neighbor called the police, and Josh was arrested and charged with attempted murder. His mother bailed him out, and since then, his trial has been scheduled and rescheduled and scheduled again. He’d been out for less than two months when we met at the Narcotics Anonymous meeting, and he was still using meth and other drugs regularly. Josh and I stood looking into the kitchen, where paper towels and all-purpose cleaner still sat on the counter. It was hard to imagine where he could go from here. He’d been denied access to a new in-patient recovery center, in nearby Steamboat Springs, because of the criminal charges against him. Beyond that, options were few: a long-term in-patient rehab in Vernal, Utah, 120 miles away, a detox center in Glenwood Springs, 115 miles away, or long-term care in Denver, a nearly four-hour drive from here. Josh didn’t like his odds of recovery outside of Craig, tough as things may be here in his hometown. Denver, after all, was where he first encountered heroin. A woman and her husband discuss housing options while they stand on the street with their family’s belongings after leaving the place they were staying because of a physical altercation. Meanwhile, the local authorities had come to arrest the owners of the house, where as many as 10 people had been staying, and where Josh Flaharty says he used to stay and get drugs. As addicts like Josh Flaharty and Elizabeth Tucker battle to reclaim their lives, the town of Craig seems destined to struggle with its drug problem for a long time to come. Craig’s law enforcement has grown frustrated with the few resources for drug addicts. In October, I joined Folks outside of the sheriff’s office for a training session with his drug dog, Kilo, a 5-year-old Belgian Malinois. On a sunny day with a light breeze, we stood beside his unmarked Suburban in the back parking lot, where about half a dozen other police cars were parked. Folks opened the back door of his car and Kilo leapt inside, ready for another patrol. Folks walked to the back hatch of the car, opened it, and pulled out an arsenal of training tools, certified by the DEA. Among them were four large rubber storage bins with hidden compartments. He set them out, one by one. As he positioned them on the concrete, he put a PVC pipe in the second bin from the left side, among the other three just like it that were lined up for the training. As we walked back to the Suburban, he talked about his patrols in Craig with Kilo and what happens to the people that get caught.